What’s the best kitchen compost container? You might not be shocked to hear me argue that it’s a 5 gallon bucket! To the right is my five gallon compost container. I keep it under the counter. You can see my five gallon trash can hidden behind as well. You might find that most of your kitchen waste is compostable, so your kitchen compost pail should be the same size or larger than your trash can! Compost pail engineers struggle most with the odor issue. Don’t let 5 gallons of rotting materials poison your air! Below are a bunch of techniques that eliminate smells before they become a problem. 1. Keep a Lid on it! This is the simplest solution to smells. Most of the time, you don’t need to secure your lid down, it’s enough to just rest it on top. Smell will still build up inside your compost container, lurking within until you remove the lid, so it can escape focefully and ruin your evening. That’s why lidding your bin should be used in conjunction with these other more sciency techniques. Lining the sides and bottom with paper does two things for you. It keeps the sides of your composting bin much cleaner so you can wash it easier and less often, and the very high carbon content in newspaper absorbs nitrogen from the food scraps. Since nitrogen fumes are the “stinky” component of compost, this reduces odor – sometimes significantly. Read the lining with newspaper article to learn the quickest technique. 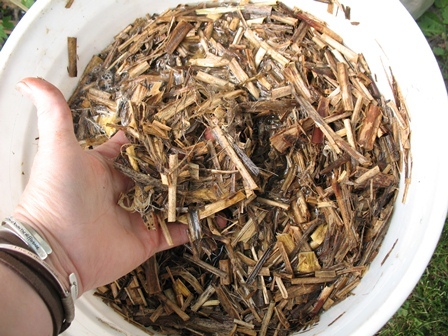 Layering with carbon as you fill your compost pail also balances your carbon/nitrogen ratio. I usually layer with torn up newspaper. Leaves, sawdust, wood chips or paper towels will also work. I avoid office paper because someone thought it would be a good idea to put lead in the ink. I reserve this fairly obvious “trick” for when the composting smell gets really out of hand. That usually only happens when I’m dumping very naughty stuff into my compost container, like meat and bones and milk. Sometimes no amount of carbon will solve your stink problem. 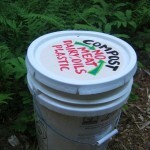 This is the method that most commercial composting bins use exclusively. The filter itself looks like a black scour pad – just like one of those things you use to scrub your oven. I prefer to integrate the carbon right into the compost as I’m collecting it. 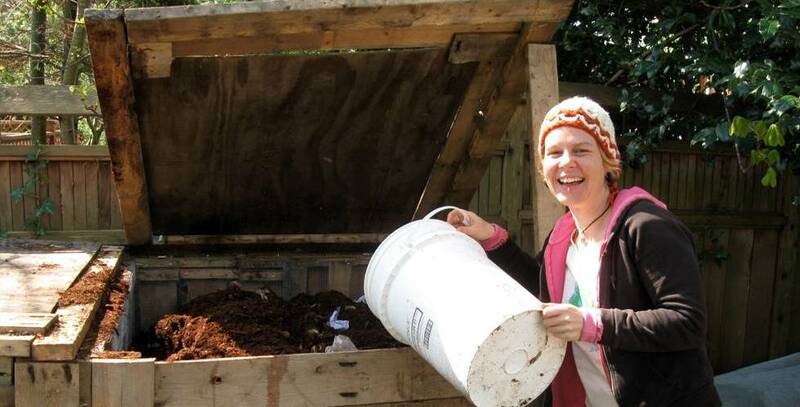 You’ve got to add carbon to a compost pile anyway, so why delay the inevitable? Of course you could modify a 5 gallon bucket to support carbon filters if you’re good at plastic smithing! You can get a whack of carbon filters all at once for dirt cheap. Here’s a link to filters for $0.35 each at the time of this writing. The filters wear out after processing too much stench, so you’ll want to keep a stock of them if you use them. 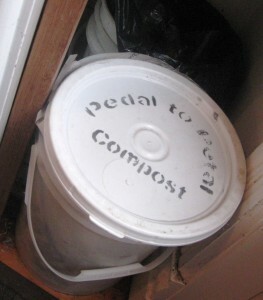 You can find out more about the pictured compost container on Amazon. I am MOST impressed. Adding it to my favorites right now! Use a Gamma lid and you won’t smell anything. What is a “Gamma lid”? You don’t want a seal on a compost bucket – it will turn the bucket anaerobic and create very stinky odours when the bucket is opened (and sometimes the gases will be pressurized, ensuring that the room is filled). I just bought a food grade 5 gallon bucket at Lowes and plan to make it into a composter. I love the info you listed about this, but you mentioned you put meat and bones in yours? I thought that was a no no? Can I put anything in there? Is there a list you might be able to provide? I want to make my own dirt for my veggie garden! 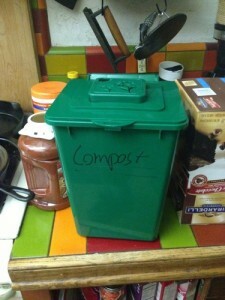 Google, BING, whatever search engine you use…”What to compost”. ? Great solution. I’ve had a number of kitchen compost buckets that call themselves “compost specific containers.” They’re never large enough for times when you have guests for corn on the cob and/or watermelon. I saw one today at Bed Bath and Beyond that you could order online for $85!!! It was no more than any trash can with pedals. A regular lid and no charcoal filters. But all the buckets I’ve owned with charcoal filters allow fruit flies in and out, and then you need a supply of filters which fit your bucket. I am so excited about just going out to Lowes for a plain ‘ol 5 gallon bucket with a lid. 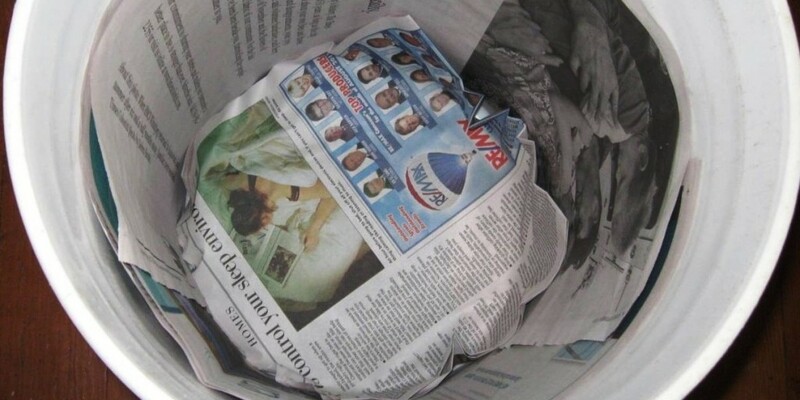 I plan to look for some biodegradable trash can liners, but if not, I will just line the bucket with newspaper as recommended. I agree that it’s best to dispose of compost regularly to avoid smells and “explosions” of fermenting ingredients. Your recommendation has saved from an ongoing and unnecessary search. Thank you so much! !